The Micronesian Kingfisher (Todiramphus cinnamominus) is a species of kingfisher from the Pacific Islands of Guam, Pohnpei and Palau. One of its subspecies, the Guam Kingfisher, is restricted to a captive breeding program following its extinction in the wild due to the introduced brown tree snake. In addition, the mysterious extinct Ry?ky? Kingfisher, known from a single specimen, is sometimes placed with the Micronesian taxon as a subspecies (T. c. miyakoensis; Fry et al.. 1992). Among-island differences in morphological, behavioral, and ecological characteristics have caused some to suggest that Micronesian Kingfisher populations should be split into separate species. The subspecies are distinguished primarily by variations in plumage and size, with the Palau birds being smallest and Guam kingfishers being largest (Pratt et al. 1987). This is a brilliantly colored, medium sized kingfisher, 20-24 cm in length. They have iridescent blue backs and rusty-cinnamon heads. Adults on Pohnpei and Palau are characterized by white underparts, while juveniles are cinnamon below. To the contrary, the adult male Micronesian Kingfishers from Guam have cinnamon underparts and Guam females and juveniles are white below. All subspecies have large laterally-flattened bills and dark legs. The calls of Micronesian Kingfishers are generally raspy chattering, and they differ in cadence and pitch among islands. 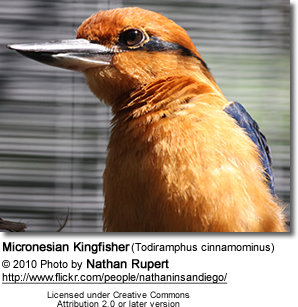 Micronesian Kingfishers are terrestrial forest generalists that tend to be somewhat secretive. On Pohnpei, the birds can be observed foraging along forest edges and from phone wires, while they are less conspicuous on the Palau islands. The diet consists entirely of crustacean and animal matter. The birds nest in cavities excavated from soft-wooded trees and arboreal termitaria, on Guam (Marshall 1989) while they are apparently obligate termitaria nesters on Pohnpei (Kesler and Haig 2005). 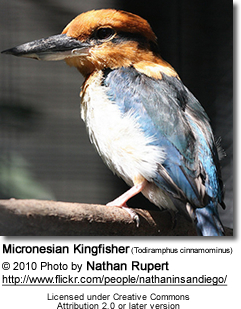 Micronesian Kingfishers defend permanent territories as breeding pairs and family groups (Kesler 2006). Both sexes care for young, and some offspring remain with parents for extended periods and through subsequent breeding attempts on Pohnpei (Kesler 2002). Two Micronesian Kingfisher subspecies are facing dire conservation threats. 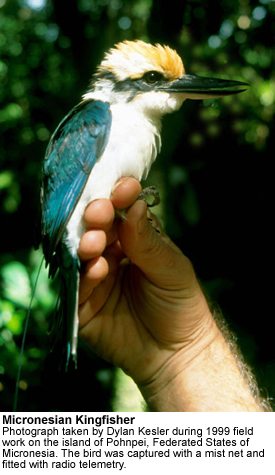 The Guam Micronesian Kingfisher population was extirpated after the introduction of brown tree snakes (Savidge 1984), and the birds are now U.S. listed as endangered (U.S. Fish and Wildlife Service 1984). 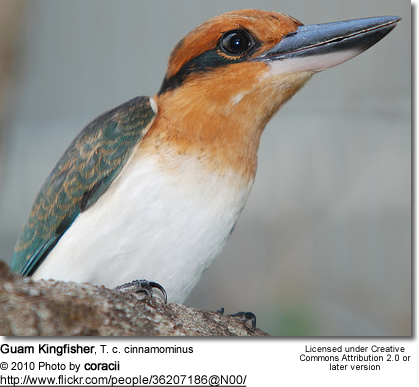 The Guam kingfishers remain only as a captive population of fewer than one hundred individuals (as of 2006) in US mainland and Guam breeding facilities. However, there are plans to reintroduce the Guam birds back to their native range if protected areas can be established in the few remaining forest tracts on Guam (US Fish and Wildlife Service 2004). Like other avian species on Pohnpei island, Micronesian Kingfisher populations declined by 63% between 1983 and 1994 surveys (Buden 2000). The cause of Pohnpei bird declines has not yet been identified. Little has been published about the status of Palau Micronesian Kingfisher populations, although the US Fish and Wildlife Service has bird survey data for the region. Buden, D.W. 2000. A comparison of 1983 and 1994 bird surveys of Pohnpei, Federated States of Micronesia. Wilson Bulletin 112:403-410. Fry, C.H., K. Fry, A. Harris. 1992. Kingfishers, Bee-eaters, and Rollers. Princeton University Press. Princeton, NJ. Haig, S.M., and J.D. Ballou. 1995. Genetic diversity among two avian species formerly endemic to Guam. Auk 112: 445-455. Haig, S.M., J.D. Ballou, and N.J. Casna. 1995. 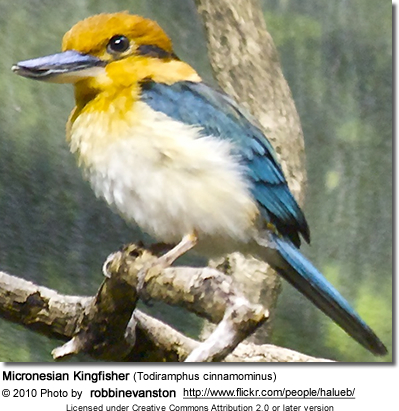 Genetic identification of kin in Micronesian Kingfishers. Journal of Heredity 86: 423-431. Kesler, D.C. 2002. Nest site selection in cooperatively breeding Pohnpei Micronesian Kingfishers (Halcyon cinnamomina reichenbachii): Does nest-site abundance limit reproductive opportunities? M.S. thesis. Oregon State University. Corvallis, OR. Kesler, D.C. 2006. Population demography, resource use, and movement in cooperatively breeding Micronesian Kingfishers. Doctoral dissertation. Oregon State University. Corvallis, OR. Kesler, D.C., and S.M. Haig. 2005. Selection of arboreal termitaria for nesting by cooperatively breeding Pohnpei Micronesian Kingfishers. Ibis 147:188-196. Marshall, S.D. 1989. Nest sites of the Micronesian Kingfisher on Guam. Wilson Bulletin 101, 472-477. Pratt, H.D., P.L. Bruner, and D.G. Berrett. 1987. The Birds of Hawaii and the Tropical Pacific. Princeton University Press. Princeton, NJ. Savidge, J. A. 1987. Extinction of an island forest avifauna by an introduced snake. Ecology 68:660-668. U.S. Fish and Wildlife Service, 2004. 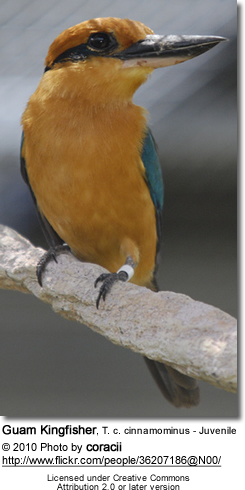 Draft Revised Recovery Plan for the Sihek or Guam Micronesian Kingfisher (Halcyon cinnamomina cinnamomina). U.S. Fish and Wildlife Service, 1984. Endangered and threatened wildlife and plants: determination of endangered status for seven birds and two bats on Guam and the Northern Mariana Islands. Federal Register 50 CFR Part 17 49(167), 33881-33885. U.S. Fish and Wildlife Service, 2004. 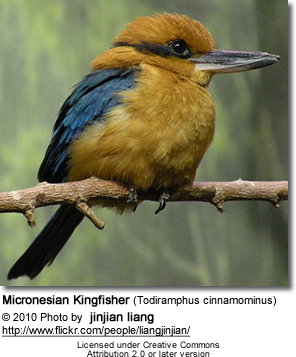 Draft Revised Recovery Plan for the Sihek or Guam Micronesian Kingfisher (Halcyon cinnamomina cinnamomina). U.S. Fish and Wildlife Service, Portland, OR.